The 23-year-old UCD captain with the SSE Airtricity League First Division trophy two weeks ago. GARY O’NEILL was sitting on the living room couch on his laptop, plotting his next move in life when his dad received a phone-call which would change the course of his career immeasurably. It was Pat Devlin, recently appointed director at UCD, and he wanted to know if the young man fancied giving football a go out in Belfield. Devlin was an old friend of O’Neill’s father, so the Tralee native decided to give it a try. He had just returned from England following spells at Wolves and Port Vale, followed by a difficult stint with English National League side Hereford United, where he has previously spoken about wages going unpaid amongst other issues during his stay. UCD offered a fresh start, he says, after returning to Ireland a little bit unsure of what direction to go next in life. After leading the club to their first SSE Airtricity League First Division title in almost a decade, two Collingwood Cups, playing in Europa League qualifiers and making it to the semi-finals of the FAI Cup for the first time since 2007, he admits that he hasn’t looked back since that fateful day when he was considering leaving the sport behind entirely. “I was at home on my laptop looking up different avenues, trying to decide whether I would go and work with my dad or whether I was going to do a part-time college course in Tralee IT, or maybe a full-time course in UCC. Going into college instead of football,” he explains. “But we were on the couch anyway and my dad’s phone rang. Calling him was a very good friend of his, Pat Devlin. Pat had just come into UCD as their new director and he pitched the idea of me maybe coming up. Going to college in UCD wasn’t even a thought in my head at the time, it was just to maybe try and play football. They had just been relegated in 2014 and I was apprehensive enough because of that bit of deflation and rejection from my experience over in England. I was kind of apprehensive about whether or not I wanted to put myself into that environment again and was a bit unsure about moving away from home again too. The 23-year-old has enjoyed a stellar season in blue. The Kerryman began 2018 by leading the side to Collingwood Cup success — the second time he has captained the side to college football’s highest honour in the last three years — and has since led the Students to the First Division title, plus to the final four of the FAI Cup where they take on Dundalk on Friday night at Oriel Park. The midfielder was named in the 2016 PFAI First Division Team of the Year and was also nominated for First Division Player of the Season that same year; with this year’s successes only seeming to build on a rapid pattern of development for the former Ireland underage international and current sports management student. O’Neill was a highly-rated prospect in Kerry as a teenager. Following impressive displays in the Kennedy Cup he was quickly snapped up by Wolves, where he spent four years in the club’s academy while Mick McCarthy was in charge of the senior setup and other Irish players like Stephen Ward, Anthony Forde, Kevin Doyle, Aaron McCarey, Stephen Hunt and Kevin Foley littered the first team. The player says that they were four very enjoyable years in the West Midlands, but that there came a point when his development and the Premier League club’s perception of that development differed, meaning being let go to Port Vale where opportunities for regular football were yet again limited during his stay in 2013. His brief spell at Conference side Hereford, sitting sixth in the English football league pyramid, brought a disappointing end to his spell across the water. He admits that he was not burned by the stay in England, but that the experience offered life lessons which have fuelled his rapid resurgence at UCD, culminating in a 2018 campaign which has surely been the player’s most successful to date and one which is raising questions about his next move. “The move to Wolves came about because I was actually playing for Kerry in the Kennedy Cup. I had quite a good tournament, we did quite well and finished seventh. I scored four or five goals I think,” he says. “I went over to a few clubs on trial like Ipswich and Leeds. But I really took a liking to Wolves and thankfully they took a liking to me too. Mick McCarthy was the manager at the time and there were a lot of Irish lads over there. “A lad that had played with my club in Kerry had been over before and I felt quite comfortable in the surroundings at Molineux. I went over twice on trial, did well, and they actually came to watch me play for Ireland against Wales in a Tri-Nations match at U15 level. “During the last weekend on trial I got a phone-call off my dad saying that Wolves had been in touch and that they wanted to offer me a contract. “I really enjoyed my time in England,” O’Neill reflects. “I see a lot of articles now urging young players to stay and do their Leaving Cert, but from my experience I learned a valuable life lesson over there as opposed to staying and getting my education. I think staying in education is absolutely vital, but I developed life skills that not many young lads would have. Being exposed to this kind of a business, because that’s what it is, and stuff like that. I’ve absolutely no regrets about what I did. I loved my time in England, it just didn’t work out for whatever reason. I wasn’t developing how they wanted me to and I moved on. But I’ve no regrets at all. “I’m sitting here now, 23-years-old, I’m doing a degree in UCD and I’m a league champion,“ he says. “I’ve used what happened to me in England, not as motivation, but to help me become a better player. I’m 23, and at this stage I’m now trying to help younger lads in UCD using the experience that I’ve had in football so far. UCD have impressed anyone and everyone that have come to watch them this season, swaggering to the SSE Airtricity League First Division title with a stylish brand of positive, passing, imposing play under manager Collie O’Neill which is made all the more impressive by the profile of his squad — one which boats young stars like Conor Davies and Neil Farrugia — where the average age is just 20.5 years-old. The club were relegated from the Premier Division in 2014 and have attempted to navigate their way back to the top-flight via the play-offs since then. 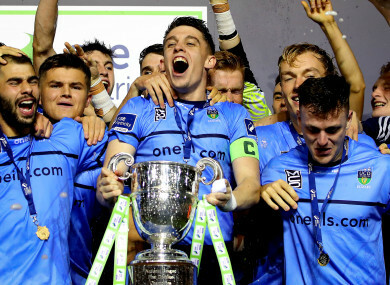 Storming to the title this year with just four defeats in 27 games and 59 goals scored (an average of 2.2 per game) signifies a new UCD, however, and a coming force which will rightly take its place in the top tier of Irish football again next season. The club finished in third place last year, 12 points adrift of champions Waterford, causing many to beg the question: what has been so different about this UCD team compared to years that have gone before? I’d have to put it down to the chemistry with the staff and the first team,” admits club captain O’Neill, who joined in 2015. “There’s a great togetherness between all the players because we’re all around the same age. The biggest difference compared to previous years would be the bond that everyone in the club has, as opposed to just the first team. The player also attributes a huge amount of the team’s recent success down to the management team at the club, led by Collie O’Neill and newly appointed assistant Ian Ryan. He says that their 1-1 draw with Finn Harps, which sealed their title win, was a long time in the making both for the club and for O’Neill personally following his stay in England as a young player. I tweeted afterwards that the title win was ‘four years’ hard work’, but for me individually it’s probably a lot longer than that. It encompasses the work I’ve put in in England. Rejection and a lot of downthrows and things like that. So to come back here and to find my love for the game again with a new bunch of lads this year has been brilliant. It has been unbelievable. “It has been four years in the making in UCD, though. We’ve fallen short in the play-offs, we missed out altogether in my second year and last season again there was no play-off on offer at all. O’Neill was born and reared in the GAA stronghold of Tralee. He brushes off the rivalry between gaelic and football in the town, and simply explains that the latter was always his calling card, despite seeing other lads like current Kerry star David Clifford have to make the difficult call between different sports when excelling at both at a young age. “My nature was always just soccer,” he says. “My dad set up our local club Kingdom Boys, which Wolves signed me from. So from day one I was around my dad watching his teams when I was four or five years old. I was going around with him at training collecting the balls, pretending that I wanted to be the next David Beckham or Steven Gerrard. For me as a young lad, soccer has always been number one. “And I’m not just saying this for the sake of it or for dramatic effect, but I genuinely don’t think I’ve ever picked up a gaelic football,” he laughs. And the stories of Clifford with the ball at his feet, as opposed to in his hands? “Left-footed, very stylish, I thought at the time that he would have a really great chance at playing in England. Lucky enough I got home to watch that year’s Kennedy Cup, and after the first two games they had six points, and I said to my dad: ‘yep, he has a chance’, because he really, really stood out. “Unfortunately he picked up an injury and didn’t get the chance to impress scouts in the later rounds with the obvious talent that was there. The rest is history now, he turned to gaelic and hasn’t looked back. He’s an unbelievable athlete, unbelievable talent. But you never know, his route in life could have been a little bit different if he had stayed on in the Kennedy Cup and not got injured. But I don’t think he’s complaining at the moment,” O’Neill laughs. UCD boasts some of Ireland’s most elite level and successful athletes across a range of different sports and codes. From Mark English in athletics, to Gary Ringrose and Josh van der Flier in rugby, to Jack McCaffrey in GAA, the university has a lot of sporting talent on offer. One of O’Neill’s former team-mates Robbie Benson is a proud alumni, too, completing his Master’s degree in actuarial science while playing football in the First Division. Balancing academic pursuits alongside sport is a complementary process, O’Neill says, with the college accommodating so that lectures and football go hand-in-hand and don’t have ill-effect on the other. “I’m doing sports management at the moment and to be honest with you, doing both here is quite easy,” he says. “I’ve the deepest respect for lads that do college on the side on top of football, where they are still playing full-time. Here is quite easy because the schedule works around college. While getting his Bachelor’s degree is naturally a high priority, he is insistent that making football his full-time career for the next number of years is his number one goal in mind at the moment. Building his career from the ground up at UCD has been a labour of absolute love, he says, and he wants to use the foundations he has put in place to try and push his career in the sport as far as it can possibly go — to play at the highest level he can, and to compete on a stage alongside the very best. Being full-time is something that I really want to get back to,” he says. “I’m not saying that I want to leave UCD — far from that. I love it here and I can honestly say UCD is the best place I’ve ever been in my career. “At a young age the most important thing is enjoying your football. But in the future I want to get back to full-time football, I want to test myself at the top level. You might get a bit envious looking at teams playing in Europe. I had a taste of it here in UCD in 2015, enjoyed it, and I want to get back to that. “You look at lads that I was playing with here in my first year, playing with the likes of Dylan Watts and Robbie Benson alongside you in midfield and you look at the clubs they’ve gone on to. For now though, his short-term priority is on Friday’s FAI Cup semi-final away to league leaders Dundalk, who have all but wrapped up their fourth Premier Division title in five years. O’Neill describes the final four clash as a “mammoth task”, but is once again adamant that this current UCD side want to, and are capable of, testing themselves against the best of the best. It is a mammoth task, I think it’s the toughest game you can play in League of Ireland — away to Dundalk,” the UCD captain states. “We’re expecting a big crowd, which is something that we’re probably not used to. “But we know what they are and we’ve done our homework on them. We’ve looked at a few points that we can maybe exploit. We know they are so strong, so there are very few of them and we’ll pay Dundalk the respect they deserve. After already beating high-ranked Premier Division opposition by way of high-flying Waterford 2-1 in the quarter-finals, it seems apparent to all that UCD are not the underdogs their position in the second tier suggests they should be. Making it all the way to a showpiece finale at Lansdowne Road at the beginning of November would simply be the perfect way to crescendo a magnanimous season, their captain says. It would just top off this year, to be honest with you, and the way this year is going I wouldn’t write us off. I wouldn’t bet against it. “Even the lads on Soccer Republic were saying after we beat Waterford in the quarter-finals that they wouldn’t fancy getting UCD in the next round. I don’t think Dundalk are under any illusions that it’ll be a walk in the park. “I think they will pay us the respect that we deserve. But to make it to the final, I just think it would top off this year. It’s been an unbelievable season. Email “‘I’ve no regrets about my time in England. I'm 23-years-old, doing a degree in UCD and am a league champion’”. Feedback on “‘I’ve no regrets about my time in England. I'm 23-years-old, doing a degree in UCD and am a league champion’”.